We are happy to report that former Foster Max, now known as Colbert, has a new home with a 17 year old boy and a 15# cat named Indy. Everything seems to be working out alright even after his immediate slip into the pool on his arrival. At least we know he can swim now. Colbert was found at the County Shelter with many wounds on his rearend and his shy and gentle nature put him on the non-adopt list. 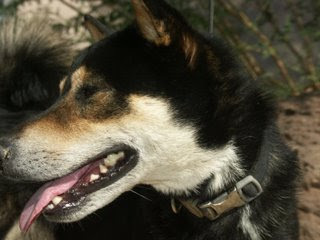 Many thanks, again, to Akita Rescue who alerted us to his presence and helped us with his vetting. We are always thankful for their help.